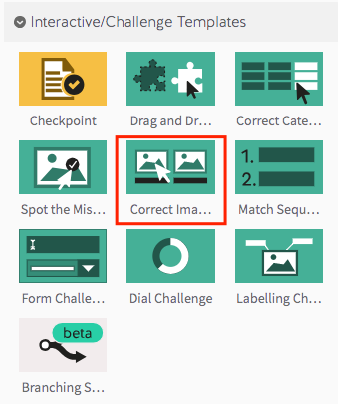 Step 1: Select the Correct Image Template from the ‘Interactive/Challenge Templates’ panel. Step 2: Drag your Correct Image Template into the Lesson Pathway. Step 6: To begin adding questions to your template, click the ‘Add New Screen’ button. Step 7: Write the text for your first question in the ‘Question Text’ box. Step 8: Add your first image option using the ‘Add Image’ button. Image Tips: Keep in mind that you can only put 2 images side by side in this template. As such, we recommend keeping images to 350 x 400 pixels in size. 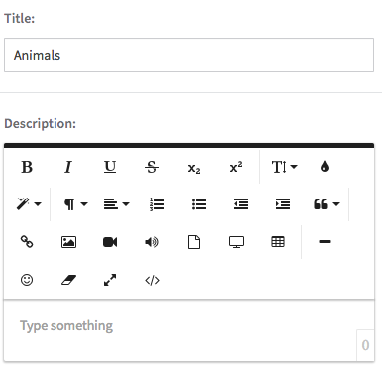 Note: You have the option of providing a caption for your first image by entering text in the ‘Caption’ box. Step 9: Add a feedback message for your image option and tick the box next to ‘Correct’ if this image represents the correct answer to your question. Step 10: Select the ‘Add New Choice’ button and repeat the process to add more options to your question. Step 11: When you’re done adding image options, select the green checkmark to save your changes. Note: To add more questions, repeat the process from Step 6. You can re-order your questions using the ‘drag and drop’ handles on the left. The order they’re displayed in here is the order that will be displayed to Participants.